Just a few more days left for Christmas in July! 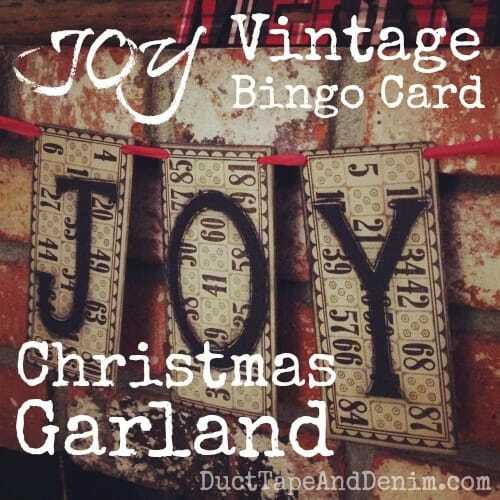 I made this JOY Bingo card Christmas garland a few years ago with some old Bingo cards I found at an antique sale. 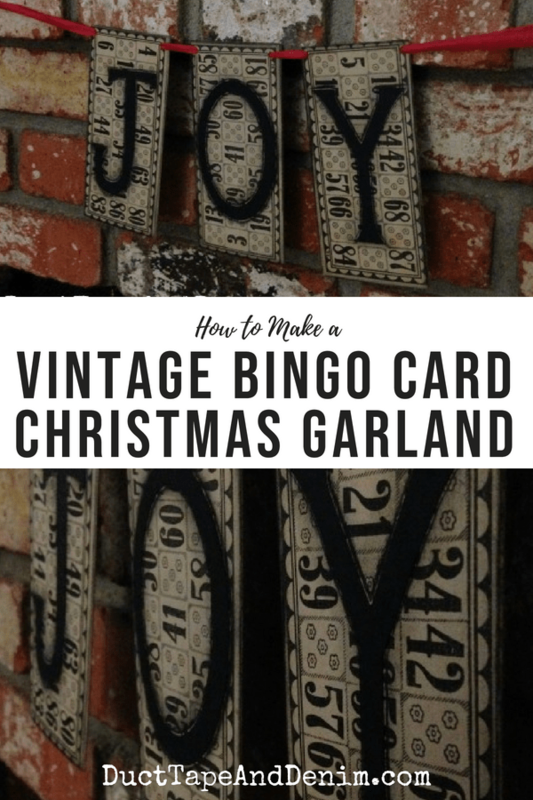 This style of Bingo is called Tombola. These are actual cards but I have scanned them and printed them for projects, too. Just in case you don’t want to use your actual old cards. This post contains affiliate links. You won’t pay any more when you use these but I’ll earn a small percentage of anything you purchase which helps support my little blog! Thanks!!! My friend cut these letters for me with her Cricut machine but I’ve also made others by just drawing letters on scrap paper until I got them to look like I wanted them to. Then I traced them onto the colored card stock and cut them out. 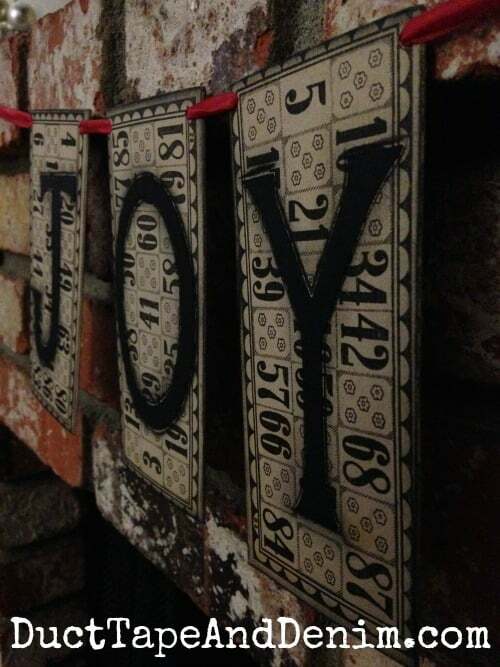 After glueing them down with a glue stick I traced around each letter and the edge of the Bingo card with a soft charcoal pencil. Then I smudged the lines with my finger. This gave it more dimension and made everything look more finished than if I just stuck the paper on. I punched holes in the top corners and ran some of my red seam binding through it. 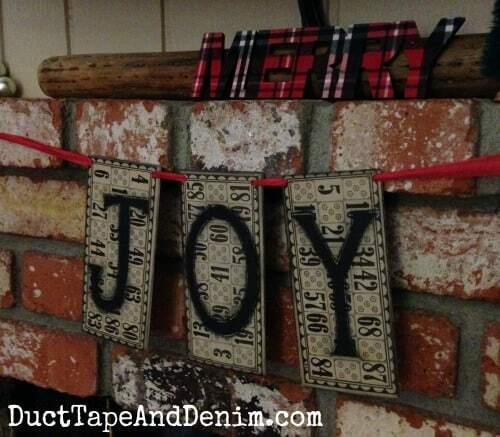 If you like crafting with vintage items and would like some ideas to repurpose them into Christmas decor please sign up for our 12 Days of Christmas Crafting. You’ll get daily emails full of ideas for 12 days starting in the fall. Sorry for the poor photos. Our living room doesn’t have very good lighting. I’ll take better ones with my new camera when I pull out my Christmas decorations this year.